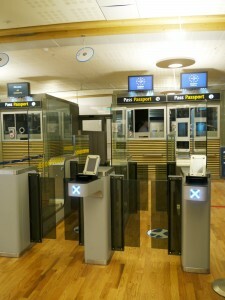 2012-12-21 — /travelprnews.com/ — As the first airport in Norway, Oslo Airport can now offer travellers arriving from Non-Schengen countries a simpler and more efficient passport control. The service is called EasyPass and was implemented on 17 December with full operation from 7 January 2013. The service is available to travellers who hold a Norwegian biometric passport. The system has been designed in collaboration with the National Police Directorate. Two automated units for self-service passport control have been placed at the Non-Schengen arrival gate. “We are pleased to be able to offer travellers a more efficient journey through Oslo Airport. EasyPass is an important step towards automating travel for the journey for those who travel frequently abroad and back. We expect that this will make travelling a better experience and remove some of the bottlenecks we have had at the airport,” says Vegar Gystad, head of media relations at Oslo Airport. The traveller scans his/her passport at the entrance to the automated unit. For valid passports the first turnstile opens. Inside the turnstile a photograph is taken and compared with the photo in the passport. If this is a match the next turnstile will open and the border control is completed. A border guard monitors the units at all times and can override them manually. No personal data is stored in the system. “We expect that EasyPass will reduce the waiting period for all travellers in the border control in that the system frees up resources that border control can use to focus on third country citizens. The self-service passport control will prevent the formation of queues among Norwegian citizens, and eventually also travellers from the EU, EEA countries and Switzerland,” says Johan Østby in the National Police Directorate. The system has already been put into service in several places in Europe. In Australia, England and Helsinki more than 80% of travellers who had tried EasyPass stated that they felt that border control went more smoothly. This entry was posted in Airlines, Airports, Business, Flights, Tourism, Travel, Travel Management, Travel Marketing, Travel Safety, Travel Services, Travelers. Bookmark the permalink.